The now-common occurrence of HP pushing an app through their Beta app feeds that they oughtn't has struck again, this time with an app called "HP AT&T Device Alive ODD-Veer," which is almost surely meant to be the "On Device Display" app meant to run on a device as it's displayed in a retail store. The app is developed by Syncables, who has done this sort of app for multiple platforms before, including webOS. The description pithily starts with "Do not download or use this application" and our man Derek Kessler manfully ignored those instructions on his Pre 2, only to find that it's buggy, tries to clear out preferences, may attempt to add dummy accounts, and also apparently is populated with Pre Plus information right now. 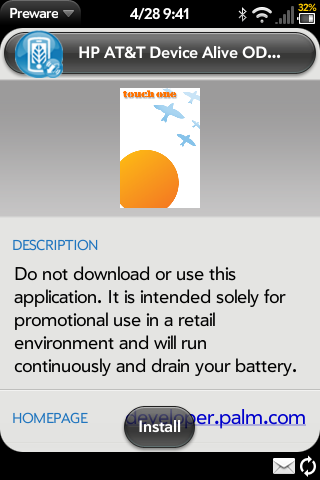 In other words, we very much agree with the app's description: don't download or use it, folks. On the other hand, feel free to go take a gander at it in the Beta app feed either in our own gallery, in Preware, or in AppScoop. Gander away until HP takes it down, that is. While you do, rejoice in the knowledge that the Veer's launch on AT&T is surely imminent and they're doing more than just slapping decals on Mini Coopers to market it. Source: Palm Beta App feed, Syncables; Thanks to rsanchez1 in our forums for the tip!